Westmeath's reign as Leinster champions was ended by Kildare today as the Lilywhites survived the unfair dismissal of Ronan Sweeney to record a three-point 0-14 to 0-11 win in an often fractious encounter in the Bank of Ireland Leinster football championship at Croke Park today. It was a deserved victory for a hungrier Kildare side, who used their greater physical power to counteract the threat of Westmeath's pacey forwards. Westmeath really only had themselves to blame for they missed a first-half penalty – Alan Mangan the culprit – and failed to take advantage of the extra man. The Lakesmen started impressively and raced into a 0-4 to 0-0 lead by the 5th minute. Sweeney was sent off in the 20th minute after receiving his second yellow card for an innocuous challenge, but this setback spurred Kildare on. Kildare veteran Glenn Ryan was to the fore in some niggly exchanges and Mayo referee Michael Daly struggled to retain control of proceedings. The provincial champions led 0-7 to 0-6 at half-time but Kildare dominated the second half and, inspired by team captain John Doyle - who scored a total of 6 points - the Lilywhites eventually pulled clear. 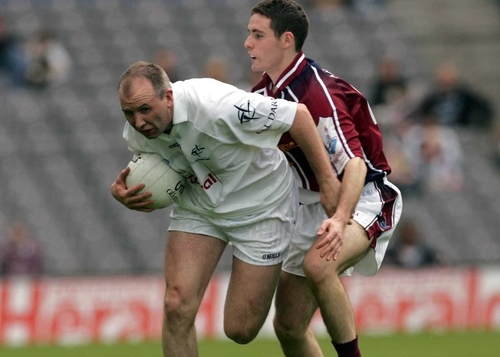 Westmeath were chronically over-reliant on Dessie Dolan, who scored a total of 7 points, but the 2004 All-Star was starved of decent ball in the second half. Denis Glennon had an off day while Alan Mangan's confidence took a battering from his poorly struck penalty, which Kildare 'keeper Enda Murphy easily saved in the first half. Dermot Earley - who was making his first competitive start of the season - had a very influential second half. And Kildare's greater ball-winning ability around midfield put the Westmeath defence under almost incessant pressure in the second half. Kildare: E Murphy; A Rainbow, P Mullarkey, J Lonergan; M Wright, G Ryan, K Ennis; K Brennan, M Foley 0-1; E Callaghan, D Earley 0-1, R Sweeney 0-1; T Fennin 0-4 (3f), R Glavin, J Doyle (capt.) 0-6 (1f). Subs: D McCormack 0-1 for Glavin (41 mins), S McKenzie Smith for Callaghan (67), D Hendy for Mullarkey (63), W Heffernan for Foley (68). Westmeath: G Connaughton; J Davitt, D Healy, J Keane; M Ennis, D Heavin, D Kilmartin; R O'Connell, D O'Shaughnessy; A Mangan 0-1, F Wilson 0-1f, P Mulvihill 0-1; David Glennon, Denis Glennon, D Dolan (capt.) 0-7 (3f). Subs: J McAteer for Kilmartin (30 mins), J Fallon for Wilson (47), G Dolan for David Glennon (59), D Duffy for Davitt (62), Paul Conway 0-1 for Denis Glennon (66).